This cute post The Perfect Fall Cheese Ball – Family Fresh Meals caught my eye and I pinned it on Pinterest. Unfortunately I didn’t get around to making it until December and no longer was a pumpkin cheese ball necessary. I am more than glad I made this Tex-Mex Cheese Ball. It was a huge hit for my birthday and all my company enjoyed it. 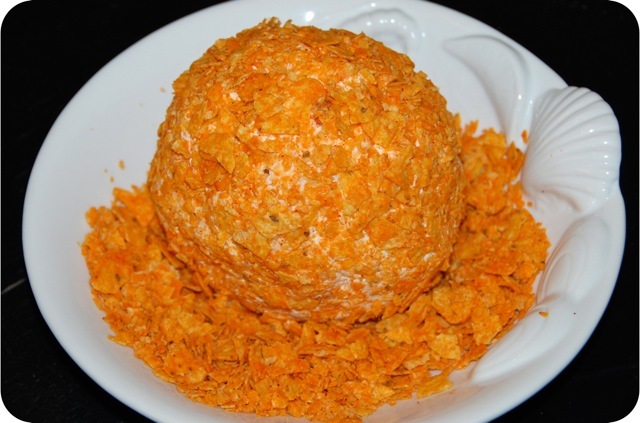 I made the cheese ball the day before to save some time the next day at the party. I even crushed my Doritos and kept them in a sealed bag to just roll and go the next day. As I was making it we had a few extra friends visiting us and helping me with the cooking. One of the little girls told me it was going to be “the hit of the party” it was so good. Making half the recipe next time would probably work. Even with my large crowd we ended up with a bunch of leftovers. Although we ate it for snack the next few days. We also used the leftovers to spread inside some chicken quesadillas which turned out great. In a stand mixer combine all ingredients but the chips. Mix until creamy and combined. Lay a large piece of plastic wrap on the counter and scoop the mixture into a mound in the center. Wrap up the ball tightly and chill at least 2 hours in the refrigerator. When ready to serve roll in the crushed chips. We served ours with tortilla chips and wheat crackers. Celery and carrots would also be very good. Posted in Appetizers, Recipes and tagged appetizer, cheese ball, cheese dorito chips, COOK, cream cheese, Cumin, dip, Home, make ahead, mexican cheese blend, nacho cheese chips, Onion, party, Recipe, salsa, shredded cheese, tex-mex cheese ball, tortilla chips. Bookmark the permalink.